By the time you read this letter, work may actually have started on the new garden design. Not just work on paper, but actual work in the garden. I’m excited to see it begin and I'm ready for it to begin. Also by the time you read this letter, I may not be able to move because I spent all weekend, or a good part of it, digging up and moving many plants that are good plants to keep, but just aren’t part of the new design or will be growing someplace else with the new design. You won’t believe it, but many of the plants are being moved to the raised bed vegetable garden. When the garden designer first suggested that I use some of the raised beds in the vegetable garden as holding nurseries for the plants, I said no. I had a flashback to 1991 when I moved from my first house to my second house and convinced my mom’s neighbor to let me put a few perennials in a small section of his very large vegetable garden until I could come back and get them for my new garden. Years later, in 2008 when they finally moved, guess what was still growing in a small section of his very large vegetable garden? Those perennials. 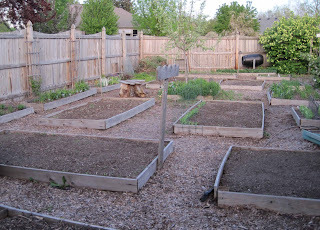 I surely don’t want that to happen in my raised vegetable garden, but I couldn’t think of any place else to put the plants, as every other garden bed will also be dug up in the hopefully near future. This does mean that I will have to be more thoughtful about which vegetables I grow this summer, but rest assured, I’ll grow as much as I can. Speaking of which, I am pleased to report that everything planted so far is up and growing, but seems a bit on the small side. I think it is because we haven’t gotten much rain in the last week or so. I’m going to water it all this evening and fertilize a bit and see if that helps. We are supposed to get some rain at the end of the week, so that should help, too. 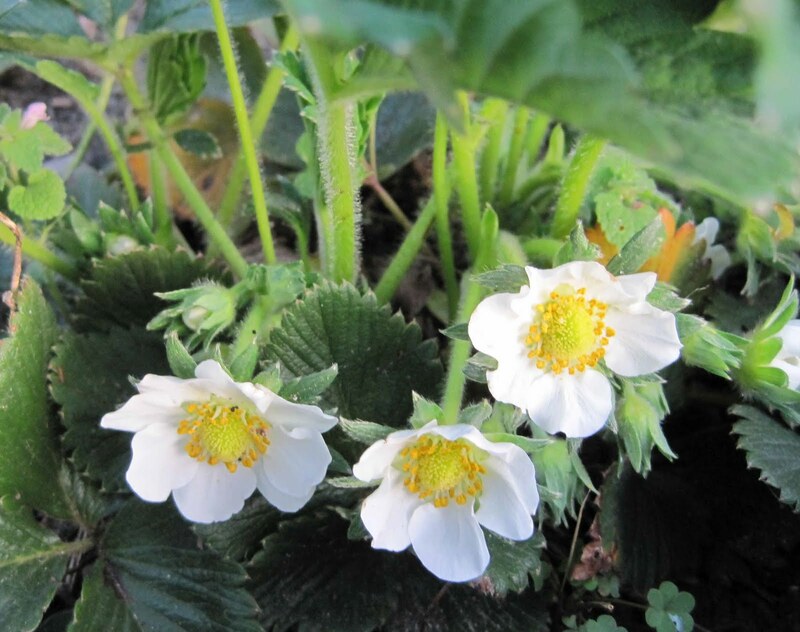 As you can see from the picture above, the strawberries are blooming. We had some freeze warnings the last few nights, but luckily we seem to have been spared from any freeze or even frost, so hopefully, there will be lots of strawberries to pick in May. I hope all is growing well in your vegetable gardens. That’s not much more to do in mine, vegetable-wise, until we are frost-free, sometime around May 10th, but that’s okay because I have a lot of plants to dig up and move or give away before work begins on the garden design in the back. P.S. Here’s a picture taken late Sunday before the sun set. So far, just the long narrow beds along the fence are full of perennials. I also planted some clematis vines along the fence, but I consider them permanent plantings. In a few weeks, I expect at least two of the 4’ x 8’ beds will also have perennials in them. P.S.S. 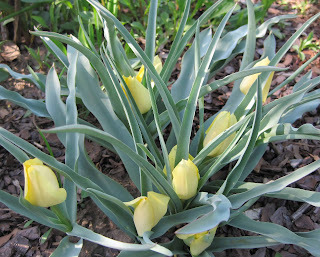 Check out this species tulip I found blooming in my garden late Sunday. I’m pretty sure this is Tulipa batalinii ‘Apricot Jewel’. It, too, will need to be moved! Hi Carol - so much work, but so worth it. Can't wait to see your design unfold. That's one of the great things about blogging. Sharing the progression - not only of our plants, but for all the work. Enjoy. And get a massage for that sore back you must have. Hope you're not too sore this morning! Am curious to see what your new design will look like, and hopefully the perennials won't cause too much trouble for the veggies. The tulips in the last pic are so pretty. When you say you "found" them, does that mean you didn't know they were there? What a nice surprise! Can't wait to see the completed project. And, it's good to be a little sore. It shows you that you accomplished something. Wow...what a lot of work. I can't wait to see those empty squares tumbling over into the walkway with green! Making a big change is always a lot of work, but change is exciting. I think its nice to have a holding bed. I met a woman who had such a bed - and it made it really easy to give away plants that visitors admired. I thought it was a wonderful example of a gardener's generosity. Congratulations on what you accomplished over the weekend. Like all your other readers, I am waiting impatiently to see this very exciting project in progress and finally completed. 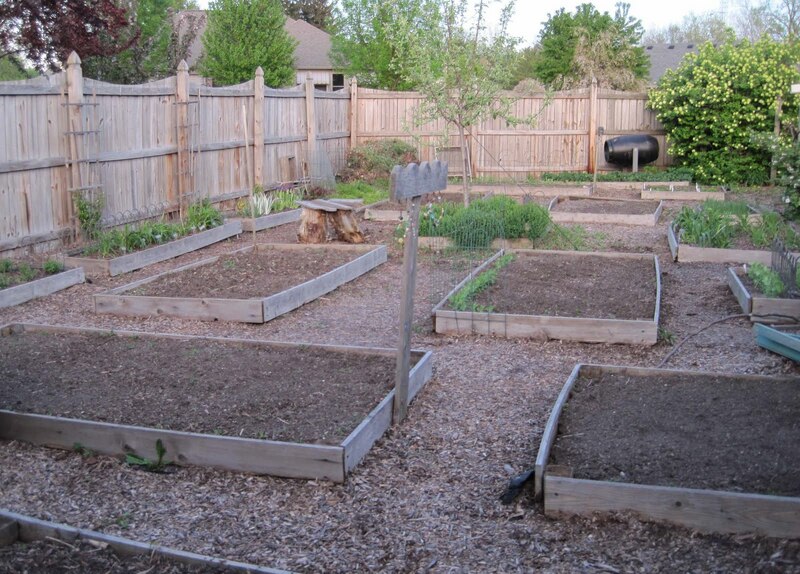 I hope you took a lot of long shots of your garden for a Before and After post, Carol. I don't have a good sense of your garden except for the entry garden and the vegetable garden. I would love to see a more overall view when it's done (or in progress!). Good luck with everything! I'm sure all your hard work will be worth the effort. Sounds like a nice hot bath with some salts and beautiful fragrance are in order to sooth your weary bones! 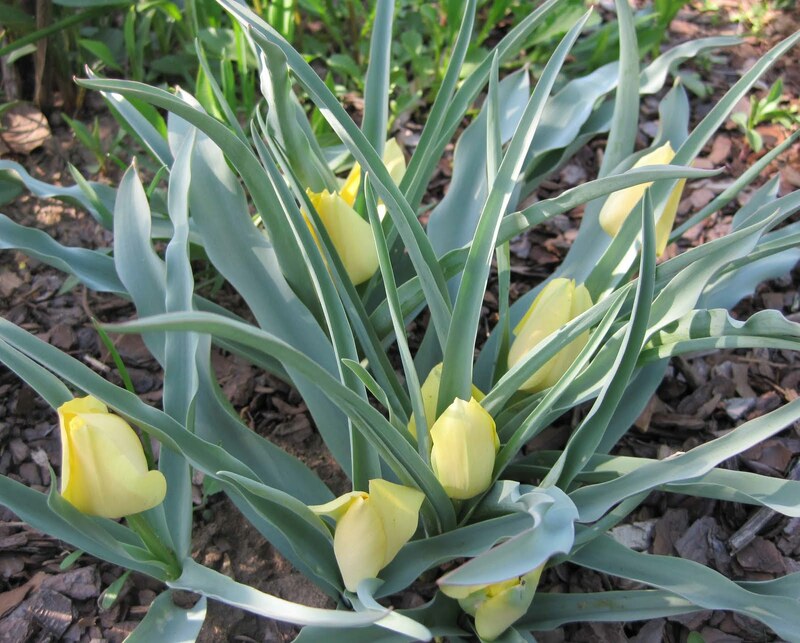 Does that Apricot Jewel tulip look pale yellow in real life, as it does in the photo?